This can be used as any tool card. The suit is hearts or diamonds. If the number is needed, a judgment is done. The number from the judgment is used. If used in a competition, it beats all other numbers. This card can be used for any single tool card. Any of them can be selected, but you only get one choice. The choices include Draw Two, Negate, Hail of Arrows, Barbarians, Harvest, Break, Steal, Duel, Blaze, Chains, Coerce, and any other unofficial tools that are included in the deck that is being used. Whatever card it generates is red. 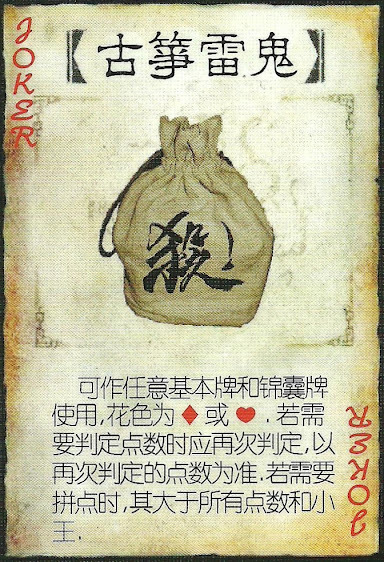 Whether it is a heart or diamond is up to the player using the card. If it comes up as a judgment, then the player performing the judgment gets to decide the suit. Spades or clubs cannot be selected since they are black. If the number is needed, a judgment is done. The number of that judgment is used. Nothing else for that card matters, not even the suit. 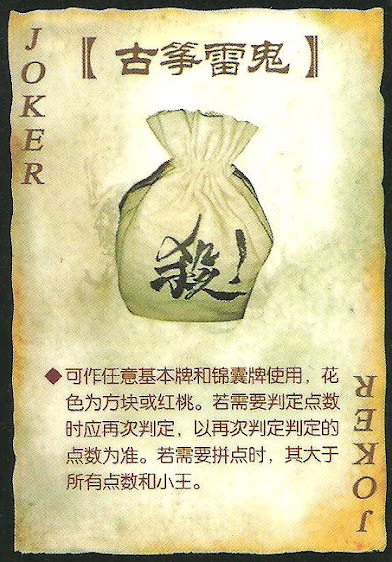 If the card is being discarded from someone's hand to modify a judgment, such as Zhang Jiao or Sima Yi, that player gets to choose the suit. Even though the judgment may belong to another player, since the card is leaving a tinkerer's hand, they get to pick the suit. The jokers beat all other cards in a competition, even the Kings. If two jokers are used in a competition, it is a tie.